Win Stuff in the Mouse Castle Fan Appreciation Giveaway! 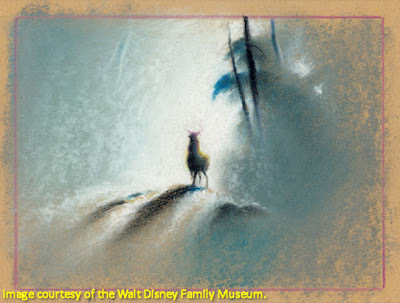 Water to Paper, Paint to Sky: The Art of Tyrus Wong by Michael Labrie, companion book to the current exhibit at the Walt Disney Family Museum plus two tickets to the museum. Snow White and the Seven Dwarfs: The Art and Creation of Walt Disney's Classic Animated Film by J. B. Kaufman, signed by Lella Smith, creative director with the Walt Disney Animation Research Library and curator of the former WDFM exhibit. The Fairest One of All: The Making of Walt Disney's Snow White and the Seven Dwarfs by J. 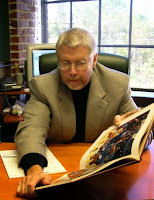 B. Kaufman. The Sword in the Stone 50th Anniversary Blu-ray Combo Pack. Robin Hood 40th Anniversary Blu-ray Combo Pack. Oz the Great and Powerful DVD. To be entered in the drawing, all you have to do is LIKE our Facebook page at www.facebook.com/themousecastle and JOIN our event at www.facebook.com/events/180775945440694/. You must be a U.S. resident to enter. Only one entry per person, please. Winners will be announced on our Facebook page after the entry deadline. Thanks for supporting The Mouse Castle and The Mouse Castle Lounge. Good luck! 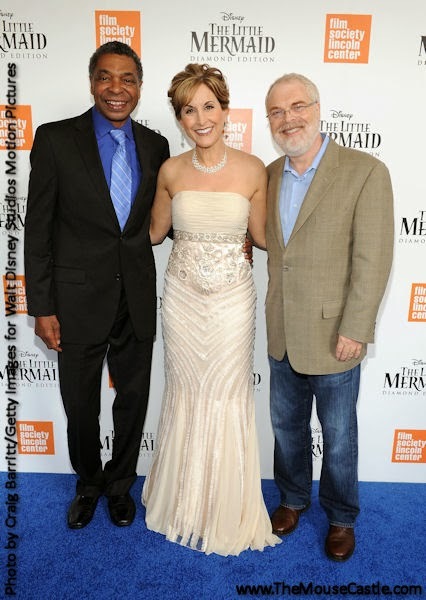 I love this photo of The Little Mermaid alums Samuel Wright (Sebastian), Jodi Benson (Ariel) and Ron Clements (writer/director) at a special Film Society of Lincoln Center screening of Mermaid in New York City on Saturday. The screening was held at the Walter Reade Theater to mark the film's October 1st Blu-ray debut. I'm back in The Mouse Castle Lounge with a terrific episode celebrating the life and art of Chinese-American artist Tyrus Wong. Wong is best known to Disney fans for his exquisite design artwork for Bambi, but his life has been so much more than that. In the 1930s, he was part of the Orientalist art movement that meshed traditional Asian styles of painting with modern Western techniques. 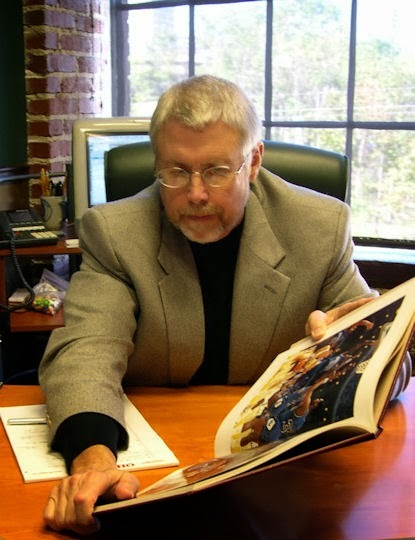 For over 25 years, he was a pre-production artist for Warner Bros., contributing to the design and look of films ranging from Rebel Without a Cause to Auntie Mame to The Wild Bunch. 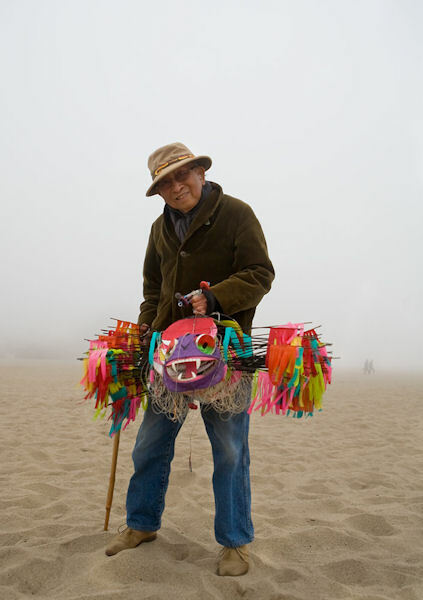 At 102 years old, he's still producing art, most notably beautiful and ornate kites that he flies on the beach at Santa Monica once a month. The Walt Disney Family Museum is showing a retrospective of his work now through February 3, 2014. Water to Paper, Paint to Sky: The Art of Tyrus Wong features over 150 paintings, sculptures and sketches from Wong's prolific and masterful career. Last month, I attended the opening of the exhibit and not only was able to sit down and speak with Mr. Wong himself, I also chatted with exhibit curator Michael Labrie, Pixar director and animator Pete Docter, historian J. B. Kaufman and Disney artist (and the voice of Donald Duck) Tony Anselmo. It was a memorable evening that made for a fantastic visit to The Mouse Castle Lounge. Enjoy! Bambi concept art by Tyrus Wong. This new app is little more than a gratuitous promotion to get you to buy Iron Man 3 on Blu-ray starting September 24th. To be honest, I really don't think it does all that much. But dude...it's Jarvis! On your iPad (and iPhone)! For free! Vanellope von Schweetz: What's the big deal over that crummy medal, anyway? Wreck-It Ralph: I bring that baby home I'll get fireworks, ice sculptures, pies! It's grown up stuff, a kid wouldn't understand. I don't recall fireworks, ice sculptures or pies, but they did give me a banana and bottled water with my medal. It was totally worth it. I'm hardly what you'd call a runner. I'm a walker. Most mornings, I tool around my neighborhood (what some would call power walking) because it clears my head and gives me a half hour or so of quiet time before the day gets started. I have no real objective to it, no long-term weight loss plan or time or distance goals. I do it because it makes me feel better, better than I would slumped on the couch eating Cheez-Its. It's just something I do without much consideration of organized running events. Until this weekend, I'd entered only one 5K race in my life--a Color Run in Las Vegas--because a friend talked me into it. I don't walk/run for competitive reasons or to see how I stack up against others. I say if we all finish the race without keeling over, that's a win. 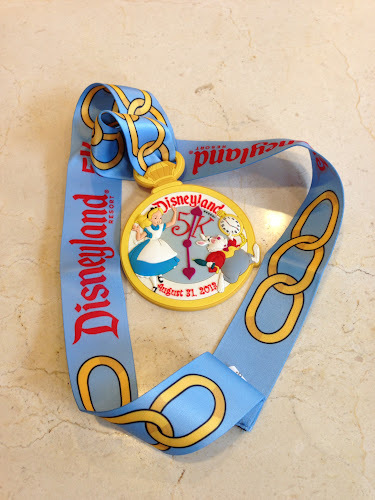 So Saturday, I (mostly) ran (and finished without keeling over) the Disneyland 5K, part of the Disneyland Half Marathon Weekend that wrapped up on Sunday. My motivation was simple. It had nothing to do with completing the course within a specific time or beating any fellow runners. I just wanted to see what it was like to run down the middle of Main Street, USA before the sun came up. 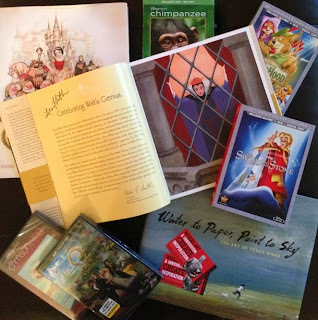 Some may call that strange, but when you're a Disney blogger, it's not strange, it's research. 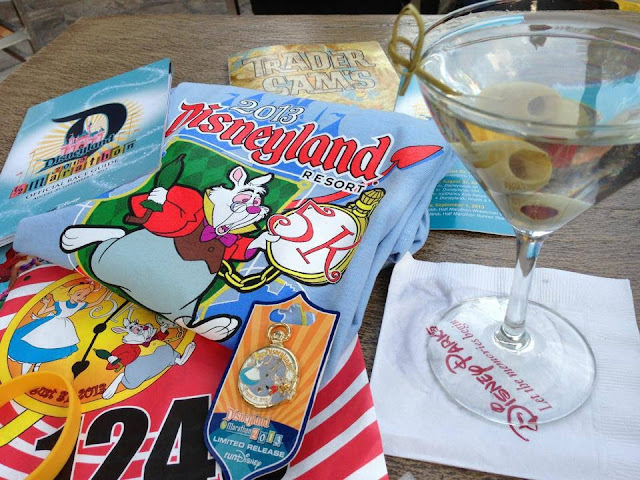 I picked up my registration packet with my bib, race guide, t-shirt and assorted tschotskes at the Disneyland Hotel on Friday afternoon. I'd heard complaints about excessive crowds making it a nightmare, but aside for the 15 minutes it took for me to find a parking space in Downtown Disney, it wasn't that bad. Registration was in the underground parking garage at the DLH Convention Center. From there I was directed to the Expo Hall upstairs where I picked up my t-shirt and that was pretty much it. There were plenty of people, but no really long lines. I roamed the Health & Fitness Expo briefly before making Trader Sam's a bigger priority (I was in training, after all). There I sorted through my bag of race goodies. My registration packet. Martini and Trader Sam's menu provided by me. Race day began early. I set my alarm for 3:30, which means I finally crawled out of bed at 4:00 to get ready for a 5:30 start. Gaaah! I walked to the Disneyland Hotel from my hotel--I was staying at the Sheraton on Harbor. It was about a mile walk to the start line. I could have taken a shuttle, but the walk seemed like a better warm up and I was happy to see I wasn't the only one who thought so (although I did see plenty of full shuttles en route--slackers!). Once at the DLH parking lot, I was herded with my fellow entrants to our starting area on Disneyland Drive (10K-ers remained in the parking lot awaiting their 6:15 start). It was still dark when I arrived at the 5k corral shortly after 5:00 a.m. And there were a ton of people already in front of me. After the gun went off at 5:30, my neighbors and I probably didn't cross the starting line until 5:40. That's when the fun really began. 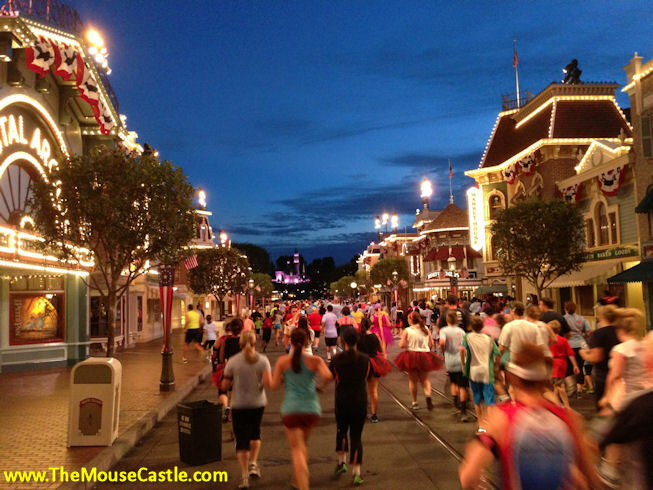 The start of the Disneyland 5K. Did I mention it was really dark...and crowded? I'm not an experienced runner. Not under these circumstances, anyway. There were a lot of people to navigate around. A. Lot. Of. People. Starting from the back of the pack didn't help either. Going into the event, I had planned on power walking the whole course, staying within myself, not overdoing it. Surrounded by the masses, though--some walking, some running--I felt entirely closed in. Claustrophobia? Maybe. Or maybe something else. All I know was my first instinct was to find open space and the only way to that was to run. Okay, not really a run, but a jog damn faster than my walking pace. And I kept at it. Down the service road to the backside of Radiator Springs, winding through DCA past Carthay Circle, across the Esplanade to Disneyland, meandering down Main Street towards the Matterhorn, making a sharp left into Fantasyland, chasing down Big Thunder Trail, around the banks of the Rivers of America, past the Haunted Mansion, out the back of Critter Country into the backstage areas, returning to the Esplanade then heading home to the finish through Downtown Disney. All the while dodging people left and right. Navigating around them, between them. I didn't run the whole course--a man's got to know his limitations--but I easily ran two thirds of it. And yes, I timed myself, 36 minutes, 20 seconds. Not record-breaking, but respectable for an old dude like me. And okay, fine, I'll admit it. I enjoyed passing people, especially at the finish (we won't talk about all the people who passed me). Dammit, Disneyland, you made me get all competitive in this thing. Sometime during the race, the outcome mattered to me. To make time, I slowed down only when I felt fatigued or traffic dictated it. I even passed up on-course photo-ops with Disney characters. I did stop to take a pre-dawn shot of Main Street, though. It's funny you should ask that. I just registered for the Tinker Bell 10K in January. That's ten with a capital one-zero. 6.2 miles. And in that race they give you an official time. And a bigger, shinier medal. I'm not that competitive. I'm doing this just for fun. Really. I better get fireworks and an ice sculpture. For more information about runDisney events, visit www.rundisney.com.